This dramatic building in The Netherlands is actually a charging station for electric boats. 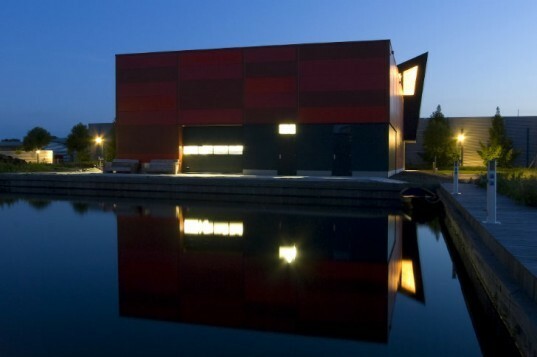 Designed by Groosman Partners, the Elektrobotenhuis is located next to the water and also doubles as a showroom and warehouse to sell electric boats. 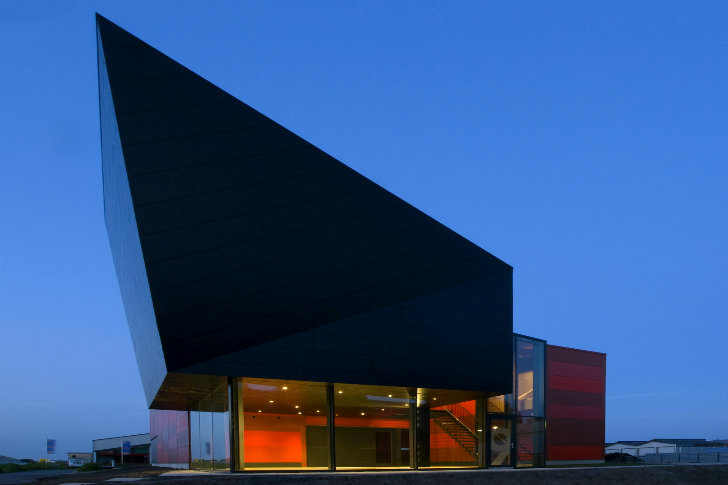 A monolithic black volume juts up to the sky and floats over the exhibition space, which is topped with 72 solar panels. The building was also designed with durability, recyclability, and sustainability in mind. The Electric Boathouse is a warehouse with an extensive range of machinery to build electric boats, as well as an indoor exhibition space where boats can float in the water. Its dramatic form is composed of a red-brick block with a pyramidal black volume that seems to float over the showroom. Glass windows and skylights fill the space with natural light, and the building is topped off with 72 solar panels that generate energy to charge electric boats. The system provides approximately 11,072 kWh each year, which can charge about 1,385 electric boats. Beyond the solar system, the facility also includes a number of sustainable strategies to reduce its impact. Rainwater is collected and stored in a tank and then used to wash the boats and flush the toilets. A ground source heat pump provides energy efficient heating and cooling. The building was designed and constructed with Cradle to Cradle concepts in mind, ensuring that the building is not only durable, but easily recyclable at the end of its life. The Electric Boathouse is a warehouse with an extensive range of machinery to build electric boats, as well as an indoor exhibition space where the boats can float in water. Its dramatic form is composed of a red-brick block with a pyramidal black volume that seems to float over the showroom. Glass windows and skylights fill the space with natural light. The building is topped off with 72 solar panels that generate energy to charge electric boats. The system provides approximately 11,072 kWh each year, which can charge about 1,385 electric boats. Beyond the solar system, the facility also includes a number of sustainable strategies to reduce its impact. Rainwater is collected and stored in a tank and then used to wash the boats and flush the toilets. A ground source heat pump provides energy efficient heating and cooling. The building was designed and constructed with the concepts of Cradle to Cradle in mind to ensure that the building is both durable and easily recyclable at the end of its life. "We call it the red lego blocks," said the neighbor, while a passing person stops and looks a puzzled. The neighbor continues: "It's totally different than the standard industrial buildings you see here. It takes some getting used to, but it is special and nice. "